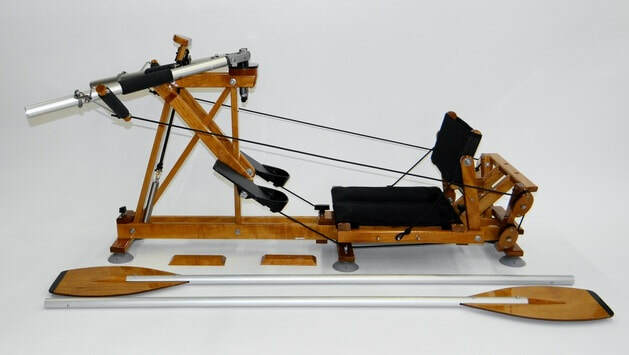 FrontRower rowing system. Oars snap apart for storage or transportation. The FrontRower™ is a "drop-in" rowing rig designed for use in rowboats and canoes. 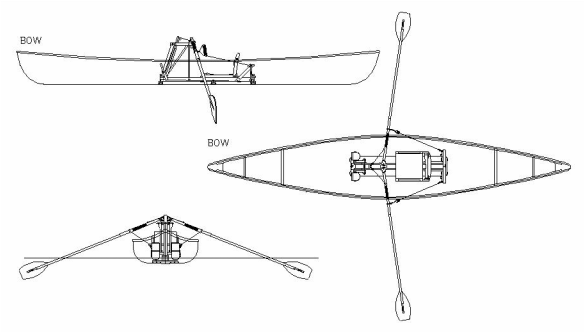 The system includes frame, seat and oars. It rests on suction cups which act as resilient mounting feet and conform to the shape of the boat bottom. It is held in place with two thumb screws which thread into mounting pads glued onto the bottom of the boat. It is easy to remove and fits on the back seat of most 4-door cars and SUVs. FrontRower™ rowing system installed in canoe. The FrontRower™ is designed to be comfortable, efficient and easy to use. You row it facing forward, so you can see where you are going without twisting around. It has a big comfortable seat with an adjustable reclining backrest. It uses pedals to develop leg power more efficiently than a sliding seat. The oars lift and dip automatically--making it very easy to use. And it has swiveling power handles allowing the oars to feather (rotating the blades from vertical to flat) automatically, without complicated wrist rotation. You can row the FrontRower™ with your hands and your feet together, so you can generate lots of power and get a full body workout. Or you can row it with just your feet (hands free). This means you can use your hands for other things—like taking pictures or casting a fishing line. You can row it with just your hands, using a completely different set of muscles. ​To obtain forward motion while pulling on the oars, we reversed the position of the oarlock and the handle (technically converting them from class 2 to class 3 levers). This gives you the same mechanical advantage but with a shorter oar which moves in the opposite direction. 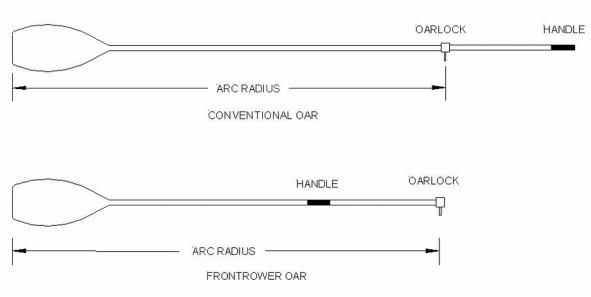 The oars are shorter by the overhanging handle length. They swing the same arc as the longer oars, and the boat travels the same distance per stroke. This makes it handy for "hybrid rowing" which is using a rear-facing sliding-seat rig and a FrontRower™ rig in the same boat. The FrontRower™ has the oarlocks mounted on a pedestal in the middle of the boat. The need for outriggers on narrow-hulled boats has been eliminated. This makes it easy to bring your boat up close alongside a dock or another boat. The FrontRower™ system uses moving pedals to develop leg power. There are two pedals, each independent from the other, and each connected to it's own oar by ropes and pulleys. The ropes travel under the seat then up and forward to the oars. The ropes pull the oars from behind in the same direction that you would pull with your hands. There are several advantages to using moving pedals (rather than a sliding seat) to develop leg power. It is more efficient, because it minimizes moving mass and weight shifting during the stroke. This is part of the reason the FrontRower™ is faster than conventional sliding-seat rowing. It enables hands-free rowing, because the oars can be operated independently by the pedals through the ropes. Conventional rowing requires your hands on the oars at all times. This is the easiest way to row your boat. When your push on a pedal, it makes the oar drop into the water and move rearward (driving the boat forward). When you stop pushing, the oar lifts out of the water and a spring pulls it forward, ready for the next stroke. The oars also feather automatically (rotating the blades form vertical horizontal) when the oars swing forward above the water. If you push with both feet together in smooth steady strokes you will go straight ahead. To turn, you take longer strokes on one side, just as you would with conventional oars. For hand rowing, you take your feet off the pedals and use only the swiveling power handles for power. This uses a completely different set of muscles than foot rowing. The handles are swivel connected to the oars and no wrist rotation is required, allowing the oars to feather automatically. For full body power, you use your feet and hands together, pushing with your feet and pulling with your hands. This extra power comes in handy when you want to row upstream or into strong headwinds or if you want to get a higher intensity workout. Rowing with a pair of oars has advantages over using a single hand-held paddle. This is especially true when paddling solo. You have a great deal more propulsive power, so you can move a heavily loaded boat more easily against wind and current. And you have more turning force, so you can turn your boat more easily against the wind. And if you are on the water for exercise purposes, rowing is as good as it gets. Rowing facing forward has important safety and practical advantages over rowing facing backward (especially in unfamiliar waters). You can see and avoid obstacles that lie ahead without twisting around. And you can see wildlife before you scare it away. You end up with a more relaxing and enjoyable time on the water. The ability to row hands-free is a unique advantage of the FrontRower™. Generating power with your legs is easier than using your arms. And it allows you to use your hands for other things (like reading charts, taking pictures, or casting a fishing line). In normal conditions you can row at cruising speed using just your legs. You only need full-body power when you want to go faster, when you need to overcome wind and current, or to get a higher intensity workout. The FrontRower™ can be retrofitted into existing boats such as canoes and touring rowboats. If you already own a suitable boat, you can use it and you won't need to buy another boat. If you don't already own a suitable boat, you can buy one locally (we will help you pick one out). Or you can buy one from us. We sell rowing canoes, custom built touring rowboats, and rowboat kits and plans. The FrontRower™ is easy to use with a short learning curve. For hands-free rowing, all you do is move the pedals forward and back with your feet in long smooth strokes. The oars lift, feather and dip automatically. To steer, you just take a longer stroke on one side. This is so easy that most people get it in the first few minutes of their first time out. The same is true for upper-body rowing—you pull back on the handles for power then swing the oars forward for the 'catch" with no need for lifting or wrist rotation. The FrontRower™ offers the same great “full-body” exercise as conventional rear-facing sliding-seat rowing. And the FrontRower™ lets you row with just your legs or just your upper body so you can isolate these areas for special attention. The fact that you can row with just your legs (hands-free) is very useful for photography and fishing. You can row and steer with your feet while using your hands for cameras or fishing gear. And it's great for touring because you can relax and enjoy the scenery without worrying about running into things. The FrontRower™ rowing system was invented by Ron Rantilla, and evolved out of his experiences solo paddling his canoe on camping trips among the islands off the coast of Maine. Sometimes the wind and current are just too much for one person using a hand-held paddle in a fully loaded canoe. After being stranded on an isolated island for three days because of strong winds, Ron began searching for a better way to propel his boat. At that time he was working as an engineer and living in Cambridge Massachusetts. He began paying attention to the scullers going up and down the Charles River and visited some of the many rowing clubs there. They were doing a lot of things right: using a pair of oars, pulling against oarlocks, and getting the power of their legs into the action. But going backwards was not going to work in the places he liked to explore. After a lot of experimenting Ron came up with a new kind of propulsion system. The new system did everything that he wanted. It was more powerful than paddling and easier to control in the wind. But what really amazed him was the speed at which he could move a canoe, easily faster than two people paddling. Curious to see how it compared with conventional rowing he installed it in a popular rowing shell. It proved to be faster than conventional rear-facing sliding-seat rowing in identical shells. Ron applied for and was awarded a patent on the system. ​It's nice to have full-body power available when you need it, but most of the time you do not. For the power levels needed for ordinary touring, the FrontRower™ gives you the options of rowing with just your hands or just your feet. It's really easy to row with your feet (using your legs for power) and if you get tired of using your legs, you can switch to rowing with your hands (using your arms and back for power). Using fresh muscles in this way is a real luxury on long trips. And rowing with your feet allows you to use your hands for other things like taking pictures or casting a fishing line. And this versatility can accommodate disabilities such as arm or leg amputations. Many people think that conventional rear-facing sliding-seat rowing is the fastest and most efficient rowing system possible. That's what they see in sanctioned races like the Olympics. But this is not the case. Competitive rowers use this system because this is what's required by the rules of the sport. Sliding seat rowing systems are powerful because they add leg power to the oars. But energy is wasted in the back-and-forth motion of the oarsman on the seat. Fixed-seat rowing systems with sliding-riggers (the overhanging structure that supports the oarlocks on narrow racing-type shells) have less oscillating mass and are more efficient. This type of system won the World Championship Men's Singles in 1981 and 1982, then the rules were changed to outlaw them. The FrontRower™ uses a fixed seat and moving pedals to generate leg power. This has even less oscillating mass than a sliding rigger. The FrontRower™ is not allowed to compete in sanctioned races. But in "open" races it has proven its ability to outperform rear-facing sliding-seat rigs in the same boats. In races like the 22 mile Blackburn Challenge (the largest open water rowing race on the East Coast) where unconventional systems are allowed to participate, a FrontRower™ power rowing shell bettered the whole fleet of identical boats using rear-facing sliding-seat rigs. This is good to know because it shows not only that the FrontRower™ is powerful and efficient, but it can handle challenging conditions. See more under Bragging Rights. The FrontRower is designed to fit in most ordinary canoes, which make excellent rowboats for touring or exercise use. If you already own a canoe, you may not need to buy another boat to experience the most comfortable, most efficient and easiest to use rowing system ever built. We also sell wooden rowboat kits and plans designed specifically for the FrontRower™.